In late August InternationalStudent.com invited you to participate in their annual Travel Video Contest where students can create a 4 minute or less video describing their proposed study abroad, or any trip they would like to take if already studying abroad. 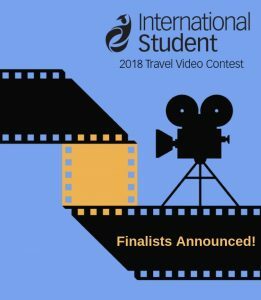 After receiving numerous entries with emotional and inspiring videos, InternationalStudent.com has announced who the lucky finalists are, including the Viewers’ Choice Winner. We encourage you to watch their amazing videos and listen to their unique stories- perhaps one of your favorites was nominated within the 12 finalists! To choose the three final winners, InternationalStudent.com has a Judging Panel comprised of leaders in international education. As well as watching the 12 finalist videos, we encourage you to check out the Viewers’ Choice winning video: Leaving Routine Behind, created by Kaleema Lowery, who is actually participating for her second time in this contest! Winning the Viewers’ Choice Award means she not only will receive $1,000, but also gains automatic entry into the finalist round. Check out Kaleema’s video and let her tell you her story through her moving video, where she shares her desire to visit and live in South Korea in order to leave the routine behind. Stay tuned as the 3 winners will be announced during the last day of the International Education Week: November 16th! If you’re interested in entering this Travel Video Contest next year make sure you sign up to receive the latest alerts from InternationalStudent.com. Enter the 2018 InternationalStudent.com Travel Video Contest! The InternationalStudent.com Travel Video Contest is back and is open for entries until October 9th! If you are planning to become an international student or if you are already one, this contest is a great opportunity for you! Keep reading to get all the details about the InternationalStudent.com Travel Video Contest! You will need to create and submit an original video before the deadline to be considered for a $4,000 grand prize. One lucky winner will receive the grand prize and their very own blog on InternationalStudent.com. There will also be a second place, third place and a viewers’ choice winner. The grand prize winner will be announced on November 16th. To be eligible you must be 18 or older and already enrolled or planning to enroll in college or university outside of your home country. If you are currently studying outside of your home country, your video must describe any trip you would like to take. If you are not currently studying outside of your home country, your entry must describe your proposed study abroad. Your video must be created specifically for the current InternationalStudent.com Travel Video Contest with a maximum length of 4 minutes. Make sure you read the full list of rules and regulations before you enter. You would also want to check the tips & tricks section and view the past winners, as well as see who will be judging your video. Get more information on how to enter the 2018 Travel Video Contest!